Be a modern Good Samaritan! The parable of the Good Samaritan (Luke 10:25-37) is a parable that can only be found in the book of Luke and cannot be found in other gospels. Yet, it has profound lessons applicable in our life today. In this post, let us re-visit the parable of the Good Samaritan and learn the vital lessons that we should derive from it. This question is asked by a lawyer. His question is a valid question to be asked to the Divine Being who will reward us with eternal life. As this might be the case, the lawyer asked this question not for the purpose to be instructed, but for the purpose of trying or testing Christ. At this point in time, we must ask ourselves to what is really our purpose in hearing or studying God’s word. Sad to say, some people are reading God’s word for the purpose to refute it and find loopholes. They want to attack the Bible and the only way to do that is to read the book. One thing I really like about Jesus when answering question is to answer a question with another question. Instead of giving the answer right ahead, He wants us to look into our hearts and minds for the answer. The lawyer answered right as what we can see in Jesus’ response. However, the lawyer is not yet satisfied with the discourse and he wanted to further try Jesus. We can now start to see what the lawyer really wanted from the conversation. He wanted to justify himself and show everyone how righteous he is. By asking the question, “who is my neighbor?” he is so sure that he was loving person his neighbor. To the Jews, they define “neighbor” who are in close proximity. They consider fellow Jews as their neighbors. Here is the start of the famous parable of the Good Samaritan. We can read that a man was traveling through from Jerusalem to Jericho. The man is robbed and left half-day. The first person to pass by is a priest. At first glance, we all would have thought that the priest will help the injured person. Of all the people, certainly, we can be sure that the priest will help him. But what happened? The priest, when he saw the injured man, passed by the other side of the road. We might infer at this point in time that the priest is afraid to defile himself. He saw the man and unsure if the man is dead or alive, he would have defiled himself if he touched the man in case the man is dead. So to avoid any inconvenience, he simply went to the other side. He forgot that one of the weightier matters of the law is MERCY. Even if he would be defiled, he should have compassion and mercy for the injured man. Another man came. Just as the priest, the Levite just passed by the other side of the road. This scenario is may not have an impact so much in our understanding. But what if we translate the word priest and Levite to our modern understanding? What is the priest or Levite is your pastor? What if it is your deacon, minister, and even your Church leader? Truly, this too can be very shocking to us. They are like private sinners and public saints. All of us in some point the same with these two people. It is good to recognize this problem, but it is better to take action to change for the better and follow Jesus’ admonitions. Here is where the flow of the story changed. The good Samaritan saw the man and he had COMPASSION. It never happened to him to consider what the nationality of the injured man is. He did not just say, “Depart in peace, be warmed and be filled”, but instead he took the time to tend to the wound of the injured man and brought him to the in. Here is a complete stranger and now owning the responsibility of someone whom he really did not know. The Samaritan exemplifies someone who takes care of his neighbor! At the end, the lawyer cannot readily admit his shortcomings. When asked who was a neighbor to the injured man, instead of answering the Samaritan, he answered the one who showed mercy. To end the conversation, Jesus wants us to do the same thing. Our neighbors are not only the people near us, the people within our community, the people within our country, or the people within our Church congregation. Our neighbor should break through boundaries. Our compassion should extend to more than space and time. How can we be a neighbor to others? Of course, it is obvious that it is not every day that we see injured people. So how can be a neighbor to others? The issue here is not WHO OUR NEIGHBORS ARE, but HOW CAN WE BE NEIGHBORS TO OTHERS. Here are some ways. Pray for others – giving a part of your time is being a neighbor to others. People may not know you are praying for them and you have a better reward for that since Jesus said that our charitable works should be kept secret. Grab every opportunity to do good – every day we are called to do small things with great love. It is not the big things that define us. One great deed is not enough. It is the habitual small things and details in our life that really makes the big difference. Visit the sick – the sick are more helpless than poor people. So make sure you visit them. Visit people who are in prison – isolation can mentally torment a person. Visit people who are in prison and make sure to encourage them. Give without thinking of being reciprocated – we are to give and help those who cannot pay us back. By doing so, we are laying up treasures in heaven and God will reward us according to our deeds. Donate – we can donate many things. It can be food, clothing, water, books, and even our time. Reaching out for the needy will surely make you happier. That’s the law of giving. These are just some of the ways you can be a neighbor to others. There are a lot of other ways and you can know these through daily Bible study, prayer, and fasting. Being a neighbor means you are being a blessing to others. 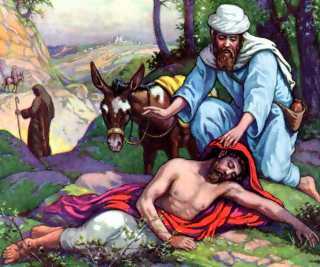 Remember the lessons from the story of the Good Samaritan and never forget to go and do likewise!